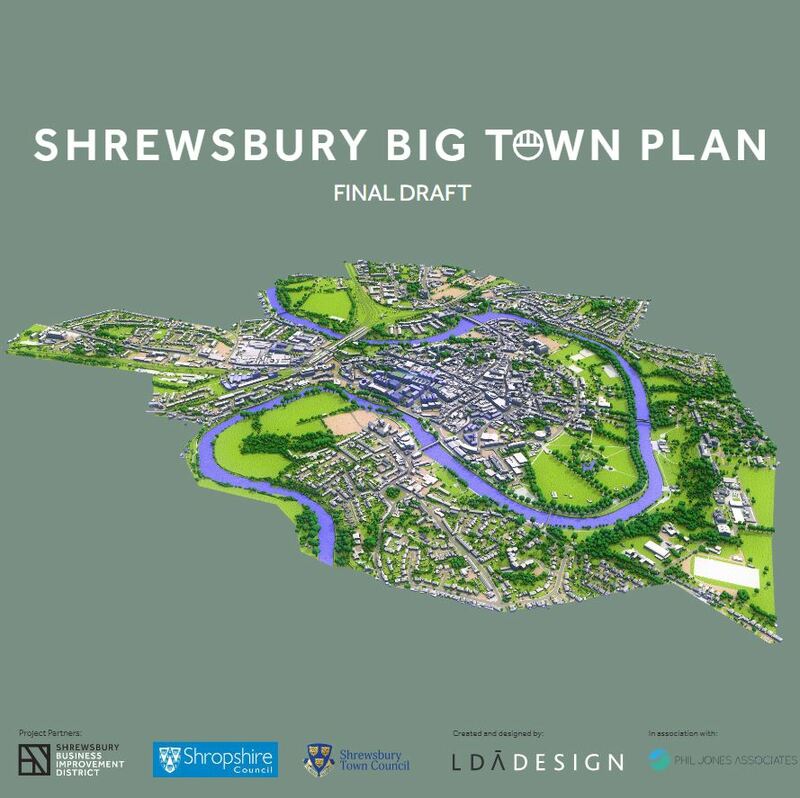 Today the three project partners leading the development of the Big Town Plan, Shrewsbury BID, Shropshire Council and Shrewsbury Town Council, have released the Final Draft of Shrewsbury’s masterplan for the town. The Final Draft outlines the vision for the town and sets the level of ambition, illustrating how the town will adapt and evolve, what the framework looks like and where change will happen, together with priorities and next steps. It is the result of a genuinely collaborative process which saw LDA Design appointed in February this year to oversee the creation of the Plan, building on the visioning work and extensive public consultation to date which saw over 2,500 comments and ideas collected from a dedicated pop up exhibition space, website and correspondence. Next steps will see the Final Draft presented this month to the three partners’ boards with further Public Consultation planned from August 1st. The August consultation period will allow the public to comment on the Final Draft online through the dedicated Big Town Plan website featuring the document and a feedback questionnaire; by visiting a three-day manned, pop up exhibition of the Plan within a town centre location, and through a public consultation event, earmarked for September 12th to be held at University Centre Shrewsbury. Further details on timings and locations will be released at the end of the month. “We are delighted to present this collective Vision for our town’s future. It presents a series of realistic, practical and sustainable aspirations; together with a clear plan of how we can get there. The Draft Plan carries four overarching aims: Rethinking movement and place; Supporting, creating and nurturing vitality, life and a mix of uses; Creating a place for enterprise; and Nurturing natural Shrewsbury. Many individuals and organisations have worked together to agree what is being billed as a far-reaching framework plan, making best use of the in-depth understanding and knowledge within the town and bringing in some of the best outside expertise in town visioning and development planning. “We have listened to what the public wants to see happen and taken soundings and insights from businesses and key stakeholders representing genuine partnership working. This Final Draft reshapes the physical public realm and matches it with an outstanding public experience, revolutionising movement around the town and attracting vital investment” commented Seb Slater, Executive Director of Shrewsbury BID.